Jack began his career in the production department where the fund-raising letters were printed and mailed. 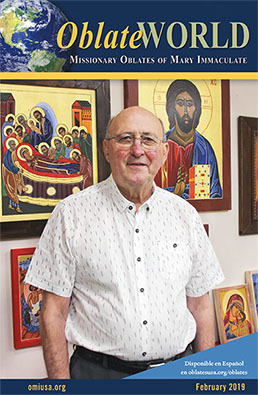 But he had been involved in photography since high school, and was soon re-assigned to take photographs for the various printed materials and press releases, and that’s what he did for the next 35 years before moving into the acquisition of premiums (thank you gifts for donors) and finally, charitable gifts. 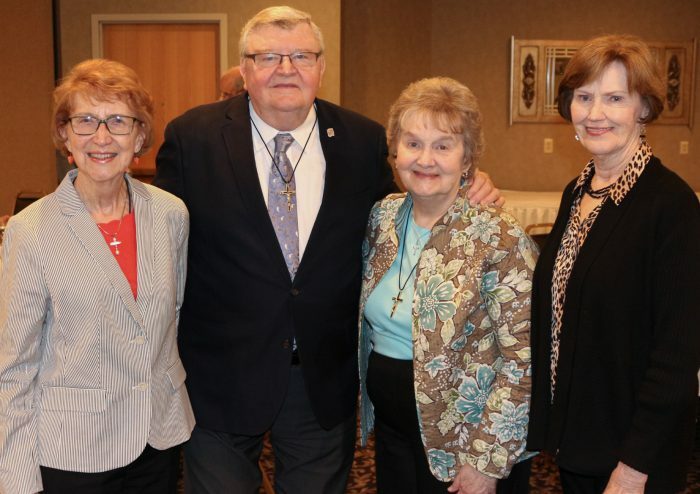 The Missionary Association of Mary Immaculate was founded in the early 1940’s to raise funds for the Oblate’s missions and for building the Shrine of Our Lady of the Snows. 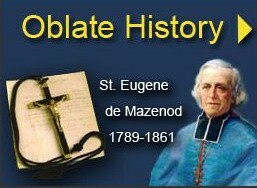 Since 1944, the Annual Novena to Our Lady of the Snows had been held at the Oblate’s St. Henry’s Seminary in Belleville. 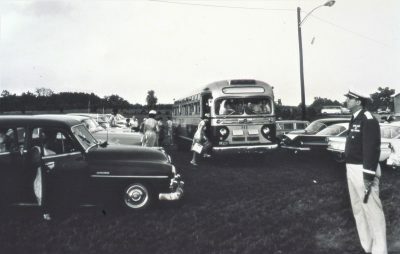 The year after Jack was hired, in 1961, the Novena was held for the first time on the partially finished Shrine grounds. Like many of the Oblate employees, Jack worked each night helping to park the hundreds of cars that brought families to pray during the Novena. Fr. Guild also recruited Jack and other employees on weekends to plant many of the trees that now tower over the Shrine’s 200 acres. 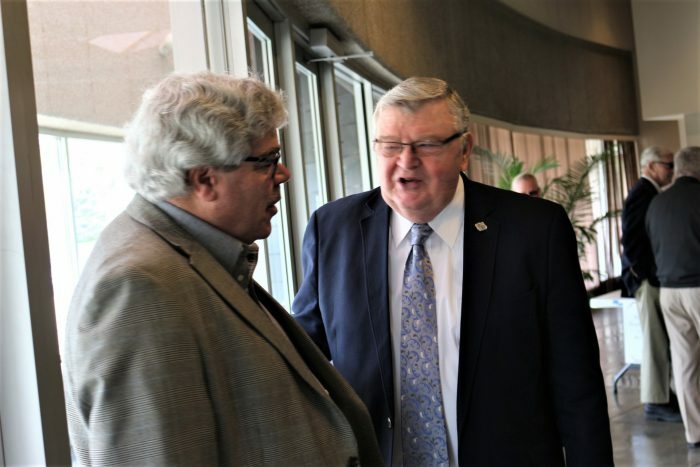 “We planted thousands of tiny trees and now they’re so tall…he would be out there with us working, he had a farmer’s tan like everyone else,” Jack recalled. 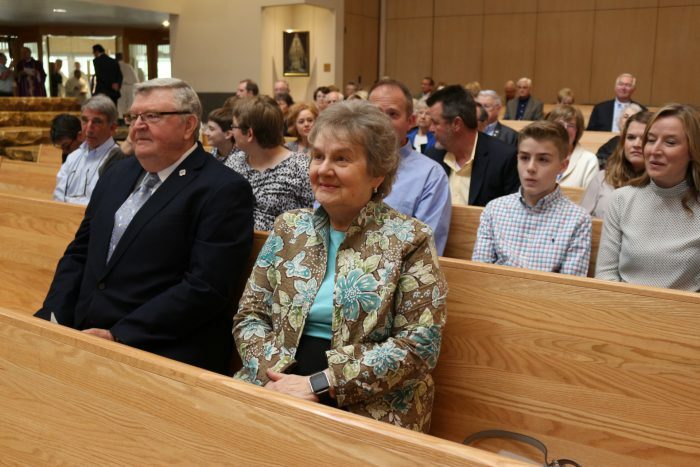 Jack and Sandy await the start of the Mass with children and grandchildren right behind them. After so many years, does Jack feel like he’s part of them? 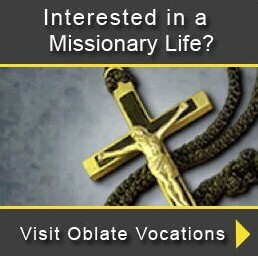 “After you work for them for so many years, sometimes I’ll say, ‘We’ when I mean the Oblates. I’ve been with them so long I feel like I’m part of them. I’ve had the chance to go to so many of their missions to take pictures. 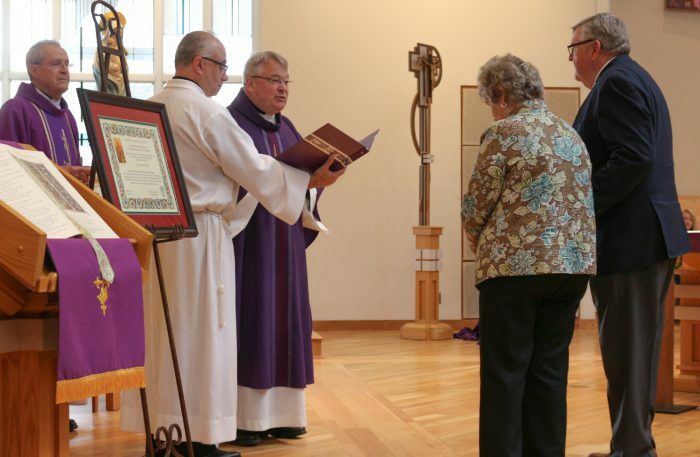 Sandy and I had the opportunity to go to Oblate ministries in Lourdes, Aix-en-Provence, and Rome, it’s been thrilling and we do feel like we’re part of it. What priests come to mind? Sandy said, “Fr. (James) Taylor, Fr. (William) Clark, and Fr. (David) Kalert, Fr. (Elmar) Mauer, Fr. (Louis) Studer more recently. He is always so friendly and makes you feel comfortable – all of them do.” Sandy then related the story of meeting Fr. Thomas Singer: “When I was introduced, I said hello and accidentally winked my eye, so since then whenever he sees me, he winks,” she laughed. Jack has special memories of Fr. 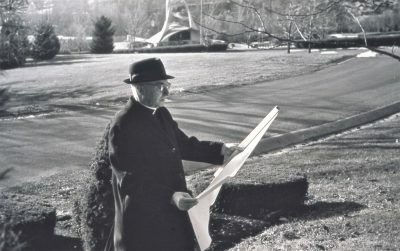 David Kalert with whom he worked closely when Fr. Kalert was Director of the Missionary Association: “Fr. Kalert was a real backbone for me at MAMI.” Jack also remembers late in his career when big changes at MAMI put his status at risk, Fr. Studer insisted that be kept on in a new position. “U.S. Provincial, Fr. 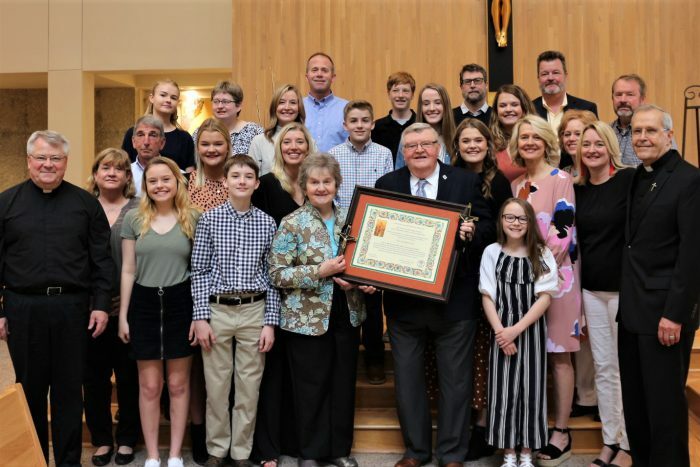 Louis Studer presided at the Mass and presented Jack and Sandy with a copy of the proclamation of their HOMI status signed by Superior General, Fr. Louis Lougen, OMI. 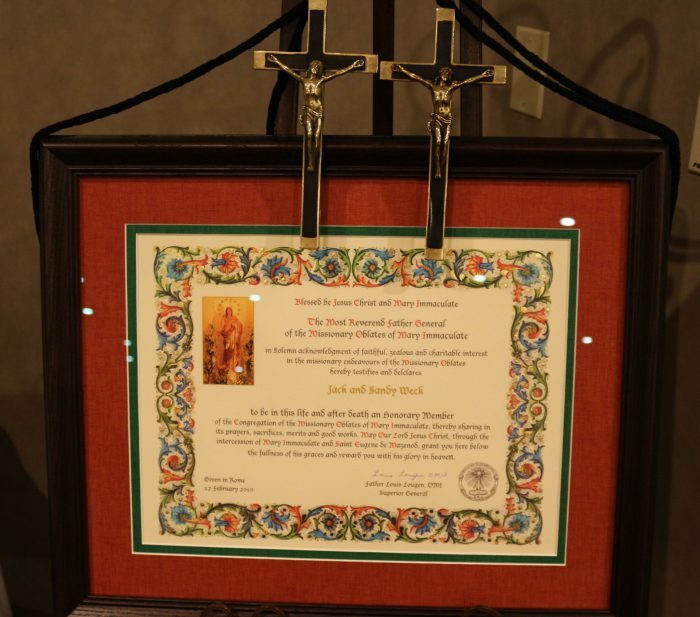 The honorees received the Oblate crosses carried by two old friends of theirs: the late Fathers William Clark and James Taylor. Fr. David Kalert delivered the homily. The official proclamation signed by Superior General, Fr. Louis Lougen, and their Oblate Crosses on top.